NB: We will use PK for Preacher’s Kid for the purpose of this work. As a PK you obviously are not at liberty to do everything you want you want to do. You must be in church, you must recite memory verses, you must be the good “boy or girl” and to make it funnier, everybody expects a perfect, pure unadulterated life from you. #Sigh! My life was monitored. It felt like I would never have a normal life.I just wanted to be FREE! Years passed and i fast approached the teenage years. At the time, the new cool was fashion for me and of course i wanna feel among. Do what my friends do and all but then remember? I am a PK. That really served as huge stumbling blocks to living the life. The first time i tried something funny as to fashion, I was in junior secondary school and my mum had travelled for a women’s conference as it was the norm. I went into her room, took her bible marker and painted my nails. Oh Gosh! it was a Friday evening so I had to be in church for rehearsals. After rehearsals, I greeted a woman in my church and the first thing she noticed was that I had painted my nails. She just shouted “so you have joined them! Have you forgotten that you are a daughter of an ordained minister?” Immediately, I knew there’s no Jupiter that’d stop my Mum from knowing. But it was just a Bible marker I thought. My mum got back and as i was expecting, she got to know and she scolded me. Being a predominant sanguine, it is only expected of me to talk a lot but because I am a PK, I dare not talk really freely because before I land, I’d hear “and you call yourself the daughter of a Pastor “. Having a boyfriend? I dare not even dare to imagine daring that. That would mean Deep trouble for me. I could remember getting so angry at one of my friend when she told me “even you? and you call yourself a pastor’s daughter o”, I just screamed and told her “my parents’ faith will not take me to heaven, leave me alone”. I want to be corrected but not because I was a pastor’s daughter, I wanted people to see and relate with me just as I am. I really wondered “where did I get it all wrong?” “Why was I born a preacher’s daughter?” But as I grew, I knew better. What makes a PK Special? Everybody in church naturally loves hanging around the pastor’s children. A friend of mine who was also a PK was telling me how a lot of girls kept writing him letters wanting to be his girlfriend. Chai! Ladies!!! I’ve seen a lot of ladies always trying to help the pastor’s wife in the kitchen. There is this feeling of “mummy must know me”. Everybody wants to hang around people who are in places of honour and as far as the church is concerned the pastor is the one in that place of honour. 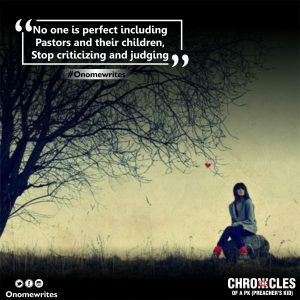 People fail to realise that Pastors are imperfect humans and same goes with their Children. It is a key attribute of humans to make mistakes. You hold no right to judge anyone. The society place a lot of demand on these children beyond what they can take. Subjecting them to a life of pretense, living a perpetual lie. They keep living in the shadows of the many demands placed on them. They never truly live. For the unlucky ones, it becomes too late for them and they grow up wanting to explore all the life that were denied of them and because they are ignorant and gullible, they fall Victims. They go wild. Dear Preacher, am I insinuating that you leave your Children to go wild? GOD FORBID! Please, understand that what it takes to be a parent in 2017 is far different from what it takes to be a parent in your time. You can’t afford the rare error of raising your Children the way you were raised. BLEND WITH THE TREND IN THE LORD. I know you might be frustrated because everybody wants you to live a perfect life. I know you might think ink nobody understands but hey, you’re so so unique. Please, know that being a PK is a rare privilege. Don’t live a casual life you are not an ordinary child! We are all imperfect humans. Judging and criticising people do more worse than good. Let us all learn to correct in love. Leadership is a place of responsibility. There is no leader that actually desires to fail in the place of leadership. Life only happens. Let us all cultivate the habit of encouraging our leaders. Be emphatic. Show sincere love. 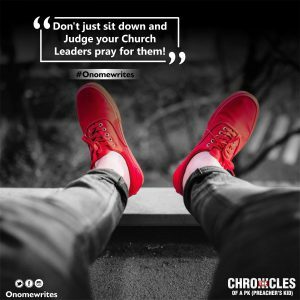 FINALLY, have you said a word of prayer for your Pastor and Leaders today? I am Omodara Oluwabunmi Onome. If this blesses you, kindly share and we will appreciate your honest feedback. anyy attention-grabbing articke like yours. thhe wweb wll pprobably bbe muchh more uswful thqn ever before. See me wishing I’m a PK… Beautiful one dear!